What to Do in Birmingham in June 2018 | Infomedia, Inc.
Start your month off sweet by celebrating National Doughnut Day. Some of our local favorites include We Have Doughnuts, Heavenly Donut Co. and Hero Doughnuts. Or bake up your own at home and mix and match glazes with sprinkles for the ultimate custom dessert. Enjoy the great outdoors and some comedic entertainment with this month’s Flicks Among the Flowers. Hosted by the Birmingham Botanical Gardens, the free event will be playing the movie Hitch. Be sure to bring your own chairs to lounge in, or pack a blanket and snacks for a small picnic. Celebrate all things nerdy at the annual event Magic City Con. The entire weekend will be dedicated to gaming, cosplay and pop culture. Spend your time perusing the various vendors, listening in at panels and meeting featured guests. Get outside on a Saturday with a visit to Woodlawn Street Market. Located in the center of historic Woodlawn, this urban market features a plethora of vendors. Discover locally grown produce, handmade bath bombs, unique accessories and more. Don’t forget that there will be a multitude of restaurants and pop-ups present as well, so come hungry. Whether you’re a social media strategist, graphic artist or are just looking to meet others in the industry, the Bham Social Media Creatives Meetup is for you. Organized by Sociallyin, a digital marketing agency, the meetup will take place over dinner at Cantina Tortilla Grill. Taste some of Birmingham’s best food trucks while supporting a good cause. Benefiting AIDS Alabama, the Funky Food Truck Festival runs from afternoon to evening at Cahaba Brewing. Barbecue, tacos, funnel cakes and more will be served on-site. Furry friends will be delighted to know that Fetch – A Treat Truck for Dogs will also be present, along with the Greater Birmingham Humane Society and their adoptable dogs. Celebrate dad this year by participating in one of the many local Birmingham events centered around Father’s Day. Special happenings include Bottomless Brunch at Iron City, discounts at the Birmingham Zoo and more. Empower the young women in your life to love computer science by participating in Girls Who Code at the Homewood Public Library. Geared towards girls in the 6th-12th grades, the free class will cover coding basics. Bringing your own laptop is suggested, but not required. Brunch and munch the day away while benefiting the local non-profit Bama Bully Rescue. Taking place at Black Market Bar and Grill, the organization will have their Bully Booth set up with merchandise including t-shirts, collars and magnets. Come spend your Sunday playing with adoptable dogs, eating biscuits and drinking a mimosa (or two). Can’t keep up with all the events in Birmingham? 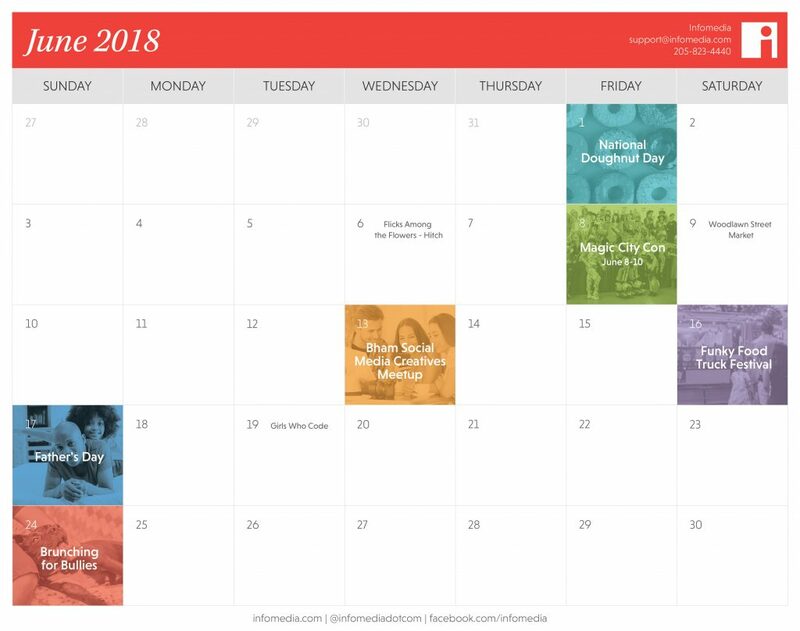 Then download our free June 2018 calendar so you never miss one.